Frisco is located in the heart of Summit County "Americas Playground". Frisco is a town with year round activities. Frisco has plenty of dinning and shopping options. The town is surrounded by outdoor adventures. 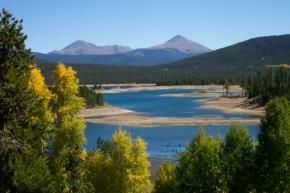 There is a marina on the shores of Lake Dillon, which offers plenty of boating opportunities. Frisco has many miles of biking on it's rec path system. SIDE NOTE, please visit bike tours on the home page of this web site. There is also a world class Nordic center in town. 4 top notch ski areas are just a short drive away. Frisco has a true Rocky Mountain feel and lifestyle for all seasons.